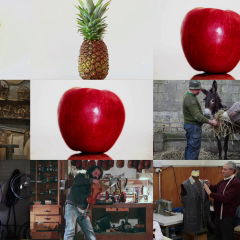 Tommaso Pedone, director and videoartist graduated from Bologna National Academy of Cinema, works in high definition digital video, taking his ideas from concept through to production. He ranges from dance and theatre productions, video interviews, art/social documentaries, to video-art and multimedia projects, expecially projecting them onto monuments and other large areas. His work is inspired by both cinema, photography and contemporary art. "Cards" is the latest work of the video trilogy that began with "Gratta e Vinci (Scratch & Win)" and it also includes "Slot Job". 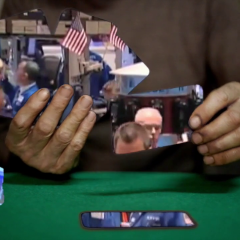 "Cards" is the latest work of the video trilogy that began with "Gratta e Vinci (Scratch & Win)" and it also includes "Slot Job".The theme is always the combination of the economic crisis that began in 2008 and gambling, this one seen as the hope, but understanding that salvation can not be through the easiest way. The spirit of survival sometimes leads in the wrong direction. The international stock markets, in this case, they manipulate the common people. Second episode of the trilogy dedicated to the binomial gambling/economical crisis. "Slot Job" focuses on the changings taking place in the world of work, in particular crafts, that are gradually disappearing from the modern landscape. A humanized slot machine represents 13 boards related to manual work with direct relationship with natural elements, in a clear reference to the past. A lutist, a shoe repairer, a farmer, alternate with stylized symbols of the slot machine, managing to keep alive what is mechanical excellence: an electronic machine. Unlike "Gratta e Vinci (Scratch and Win)" there is more than one character, a few participants, a microcosmos that simbolically sums up the craft of the twentieth century. The playful atmosphere contrasts with every movement of the roller with the effort and concentration of people at work and that calls for a reflection. The weel turns, accompanied by the sound of bells and coins inserted, untill the last scene, where a cascade of money announces the victory, but also the end of most of the professions mentioned. Videoart project with performer. Part of the “Crisis” serie, a meditation on italian and International critical moment. A deconstructed flag in action painting creates the backdrop for a man dressed as a scratch card. Luck/Destiny are the themes treated in a as conceptual as figurative project, that doesn't want to give an answer at the end but only to have a deep impact with the point of view on contemporary values. All contents are copyrighted to their respective owners.